So in between looking for a job, boning up on my Excel skills, helping my mother paint her house and other sundry tasks, I painted a new Nurgle Chaos Lord armed with a Kai Gun. If you want to read how it was done, what colors I used etc. all that information is available elsewhere online. If you have an uncontrollable urge you can head over to Cool Mini or Not and vote on this model. 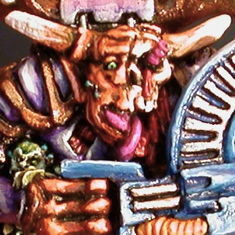 Eventually I posted a collection of my Top 10 Chaos Space Marine models on this blog and in late 2018/early 2019 I undertook a major overhaul of my web empire including my old website devoted to this Nurgle Chaos Renegade army. Also along the way I added a miniature painting blog and a featured image because I’m trying to improve the Quality of this blog. So if you have any thoughts on blogging or painting you can leave them below. This entry was originaly posted on October 17th, 2006 , it was last edited on March 19th, 2019 and is filed under: Gaming and tagged: 40K, Chaos Space Marines, Miniature Painting, Nurgle.